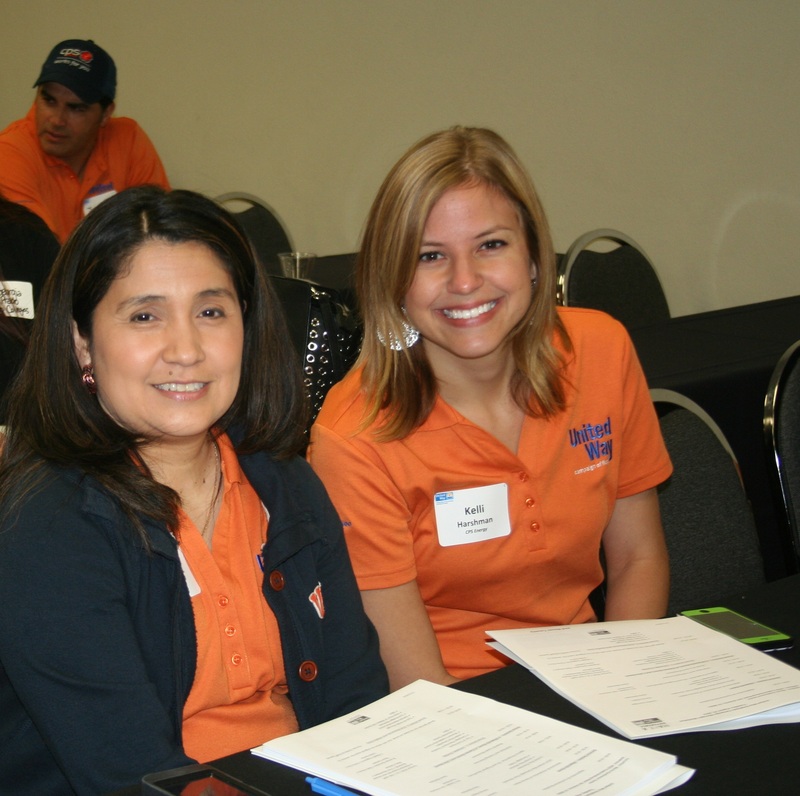 Bright orange polo shirts dotted the room of the United Way of San Antonio and Bexar County‘s Employee Campaign Manager Workshop, held Aug. 19 as volunteers from companies across Bexar County came to learn best practices as the aid agency prepares to kick off this year’s campaign. Those orange polos belonged to more than 30 CPS Energy employees serving as campaign officers this year, who heard first-hand about the continued need for advocacy and support in our community from Harvey Najim, 2014 United Way Campaign Chair. CPS Energy has a longstanding commitment to service and volunteerism. Last year our employees and retirees donated more than $980,000 toward the United Way’s record-setting $52.3 million community-wide campaign. Our desire to serve and respond to those in need is reflected in the dedication and generosity of more than one hundred employees who volunteer each year as United Way campaign officers. CPS Energy Financial Services Analyst Melissa Pena joins Kelli Harshman as campaign officers for this year’s United Way giving campaign. Campaign officers advocate year-around on behalf of United Way, sharing the merits of bringing people together to address issues preventing children and families from leading successful and healthy lives. They stand alongside hundreds of employees and retirees who are making a measurable difference in others’ lives. It’s fitting that this year’s call-to-action theme asks us to Make a Difference. “Making a difference” might be a cliché, but the generality of a cliché can lead you toward the truth when you experience it yourself. Think about it. How do you make a difference? Don’t overlook the obvious or the small. You make a difference in your work, with your loved ones. You make a difference when donate canned goods to a food pantry. When you check-in on an elderly neighbor. When you see someone in need someone in need and you don’t judge. I’m proud of CPS Energy’s commitment to service and to United Way. I’m proud of CPS Energy’s commitment to service and to United Way. In the next couple of weeks, our campaign officers will begin mobilizing employees to consider supporting United Way. CPS Energy runs an earlier campaign than most. Known as “pacesetters,” CPS Energy and other high-performing companies across Bexar County lead the way by getting a “jump start” on the United Way’s $53.5 million goal for 2014. Though United Way, our churches, schools and community, we can improve lives and advance the common good. It feels good give, to inspire and help others. Together we can create pathways toward hope and build bridges for a better tomorrow. After all, isn’t that what it means to LIVE UNITED?